The Bionic Hearing Aid is a rechargeable hearing aid designed for those who are 18 years of age or older and are experiencing mild to moderate hearing loss. It can amplify sounds and because it is rechargeable, there is no need to change tiny batteries. The Bionic Hearing Aid was developed by Lee Majors, also more widely known as the 6 Million Dollar Man. It fits inside the outer ear and can last on a full charge anywhere from 6-10 hours of operation. It should be charged in its charging case for at least 8 hours. The Bionic Hearing Aid also comes with ear caps to make it a more comfortable fit inside the ear. Now you can experience life the way it was meant to be heard with Lee Majors’ Bionic Hearing Aid. And you won’t have to deal with replacing tiny batteries anymore because it is completely rechargeable and also has adjustable volume. It also hides discretely inside the ear. Just place it inside the charging case and it will show a green indicator light when it’s fully charged. And you can adjust the amplification levels to suit your individual needs. Now you’ll know when the phone is ringing, hear phone conversations, and enjoy the sounds of nature. And each unit is equipped with an instructional pamphlet and detailed illustrations for your convenience. The cost of Bionic Hearing Aid is $14.95 plus $9.95 shipping for a total price of $24.9. The Bionic Hearing Aid is completely rechargeable and does not require any batteries. It fits inside the outer help amplify sounds for those who are experiencing mild to moderate hearing loss. The Bionic Hearing Aid is equipped with a charging case with dual charging slots as well. How do I maintain/clean my hearing aid? Make sure to keep debris free of the opening in the ear cap by using the cleaning brush to clean the hearing aid after each use. Keep your hearing aid away from heat and moisture, direct sunlight, humidity and dust. Do not wear your hearing aid while sleeping, participating in vigorous exercise or other physical activity, showering/bathing, washing your hair, swimming or engaging in any other activity during which hearing aid may get wet. Avoid using hairspray or other hair care products while wearing your hearing aid. Keep your hearing aid out of reach of infants, children and pets. Never attempt to open or disassemble your hearing aid yourself, there are no user serviceable parts inside. The advertisement says the cost is less than $300 but with these trial and shipping & handling fees, my total is more than that, why? The cost of the kit itself, which includes one Lee Majors Rechargeable Bionic Hearing Aid, a charging case, AC adaptor, AAA batteries, ear caps, brush and storage pouch, is $299.85. If you choose our trial option, the $14.95 fee is the cost for the opportunity to try the product for the first 30 days. You also pay for shipping & handling. You will not actually begin paying for the cost of the product until 30 days after delivery, at which time the $299.85 cost will be charged in three easy payments of $99.95 each. Of course, you can always opt to purchase the product outright today and pay in full. Not only will you save $27.90 on the trial and shipping & handling fees, your satisfaction is guaranteed! If you’re not happy with your purchase, simply contact us within 90 days of delivery and we’ll tell you how to return it for a full refund. The advertisement says the cost is only $14.95/$14.95 plus shipping & handling, why is it $300/more than $300? 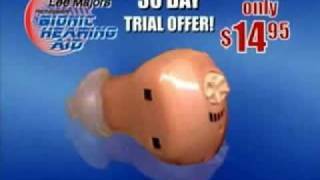 Our advertisements state that a 30 day trial of The Lee Majors Rechargeable Bionic Hearing Aid is $14.95 plus shipping & handling and three easy payments of $99.95 each thereafter. When you pay the trial fee, you are paying for the opportunity to try the hearing aid for the first 30 days, so you can see that this is the right hearing aid for you.The cost of the kit itself, which includes one Lee Majors Rechargeable Bionic Hearing Aid, a charging case, AC adaptor, AAA batteries, ear caps, brush and storage pouch, is $299.85. If you decide to keep the hearing aid, you will not actually begin paying for the cost of the product until 30 days after delivery, at which time the $299.85 cost will be charged in three easy payments of $99.95 each.Of course, you can always opt to purchase the product outright today and pay in full. Not only will you save $27.90 on the trial and shipping & handling fees, your satisfaction is guaranteed! If you’re not happy with your purchase, contact us within 90 days of delivery and we’ll tell you how to return it for a full refund. Visa, MasterCard, American Express or Discover. If your preference is to pay by check or money order, you can order by mail but will have to remit payment in full as our three easy payments option is only available if paying by credit card. Is product available in all 50 states/District of Columbia? Due to state regulations, this product is not available for sale in nor can it be shipped to California, Connecticut or Maryland. Your purchase is backed by our 90 day satisfaction guarantee which assures you a refund, less any applicable trial and shipping & handling fees, if you aren’t completely satisfied and have to return the product, in like new condition, within 90 days of delivery. Return instructions will be included in your package. While we ask that you allow 4 to 6 weeks for delivery, a 10 to 14 day timeframe is most likely. But remember, your credit card will not actually be charged until we are ready to ship your order and your 90 day return period does not begin until the day your package is delivered by the carrier. Can I get my order delivered any faster? We can rush ship your order via FedEx delivery service when it leaves our warehouse. The rush shipping and handling fee is non-refundable. Rush shipping is not available to Alaska, Florida, Hawaii or PO Boxes. To take advantage of rush shipping, select the rush shipping & handling option when you place your order. Will my first charge for $99.95 be processed if I call but my return is received at your warehouse after my first 30 days is up? Yes. Billing will occur as scheduled until your return is received and verified; but, that charge will be refunded as long as you follow the return instructions and your package is postmarked within the timeframe given to you by the representative when you call. After 72 hours, you may visit our website at www.hearingaidstatus.com at anytime to track delivery of your package. Is there a warranty on the hearing aid? Yes. The hearing aid carries a one (1) year warranty against defect and while the Lee Majors Rechargeable Bionic Hearing Aid is made to withstand many hours of non-stop daily use, there are hazards that a manufacturer’s warranty simply doesn’t cover; things like ear wax, ear moisture and humidity, not to mention battery replacements and accidents that can damage this vital part of your life. Your new hearing aid is your investment in a better quality of life; we urge you to protect it! Our protection plan covers all of the major components - hearing aid, rechargeable battery, charging case, and AC adaptor – and just about every situation you can think of, from your dog using it for a chew toy to needing to replace the rechargeable battery! Best of all, if you order extra ear pieces today, they are also covered under this protection plan at no additional cost. Think about the money you’ll save - you’ll never have to buy a new unit for covered incidents as long as your account is active and in good standing! Of course, the cost of the protection plan is fully refundable if unused and you decide to cancel and return your hearing aid within the first 90 days. Even if you keep the product, you can un-enroll from the protection plan at anytime. Complete terms and conditions will be included in your package. To order, select the protection plan option when you place your order or visit our special offers page at www.hearingaidtv.com.